The Global Volcanism Program has no activity reports for Diamond Craters. The Global Volcanism Program has no Weekly Reports available for Diamond Craters. The Global Volcanism Program has no Bulletin Reports available for Diamond Craters. Diamond Craters volcanic field consists of a 60 km2 area of basaltic lava flows and numerous cinder cones and maars located between the SE Oregon town of Burns and Steens Mountain. A basaltic pahoehoe lava field is overlain by deposits from phreatomagmatic and Strombolian eruptions that formed a late-stage central vent complex of about 20 craters and cones that densely fill a 1.1 x 1.6 km box-shaped caldera. The age is constrained to within 7320-7790 calibrated years Before Present by radiocarbon-dated floodplain deposits below the lava flows and paloemagnetic evidence (Sherrod et al., 2012). Structural doming has created a series of six overlapping topographic highs. The highest of these is known as Graben Dome; its summit is cut by a NW-SE graben 0.4 x 2.1 km long and 30 m deep. Lava flows on the E side of the field, scattered cinder cones, and maars formed during the last stage of activity. Benedict E, 2000. Diamond Craters, Oregon's geologic gem. U S Bur Land Management brochure BLM/OR/WA/GI-00/027-1122.32. Chitwood L A, 1994. Inflated basaltic lava--examples of processes and landforms from central and southeast Oregon. Oregon Geol, 56: 11-21. Friedman I, Peterson N, 1971. Obsidian hydration dating applied to dating of basaltic volcanic activity. Science, 172: 1028. Russell J K, Nicholls J, 1987. Early crystallization history of alkali olivine basalts, Diamond Craters, Oregon. Geochim Cosmochim Acta, 51: 143-154. Sherrod D R, Champion D E, McGeehin J P, 2012. Age and duration of volcanic activity at Diamond Craters, southeastern Oregon. J. Volcanol. Geotherm. Res., 247-248: 108-114. Smith W D, 1927. Contribution to the geology of southeastern Oregon (Steens and Pueblo Mountains). J Geol, 35: 421-440. There is no Deformation History data available for Diamond Craters. There is no Emissions History data available for Diamond Craters. Diamond Craters in SE Oregon is a 60 sq km volcanic field consisting of basaltic lava flows and numerous cones and craters. 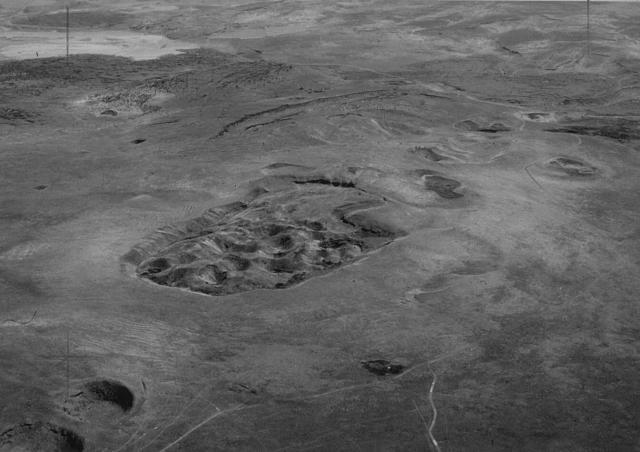 The central vent complex in this photo formed as a result of explosive eruptions from as many as 20 craters and cones. The age of the latest volcanic activity is not known precisely, but could be as young as late Pleistocene or early Holocene. Oregon Dept. Geology and Mineral Industries photo in Green and Short (1971). Lava flows of West Dome, one the structural highpoints of Diamond Craters, rise NE of lake-filled Malheur Maar. The shallow 2-m-deep lake occupies one of many maars (the rest of which are dry) of the Diamond Craters volcanic field. 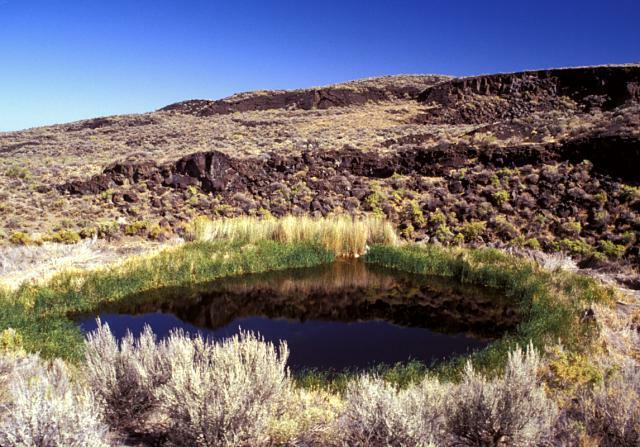 Diamond Craters consists of a 60 sq km area of basaltic lava flows, cinder cones, and maars that form a unique geologic environment in the high desert country of SE Oregon. Initial eruptions of pahoehoe lava flows were followed by magma injection that produced six structural highs of up to 120 m.
There are no samples for Diamond Craters in the Smithsonian's NMNH Department of Mineral Sciences Rock and Ore collection. IRIS seismic stations/networks Incorporated Research Institutions for Seismology (IRIS) Data Services map showing the location of seismic stations from all available networks (permanent or temporary) within a radius of 0.18° (about 20 km at mid-latitudes) from the given location of Diamond Craters. Users can customize a variety of filters and options in the left panel. Note that if there are no stations are known the map will default to show the entire world with a "No data matched request" error notice. Large Eruptions of Diamond Craters Information about large Quaternary eruptions (VEI >= 4) is cataloged in the Large Magnitude Explosive Volcanic Eruptions (LaMEVE) database of the Volcano Global Risk Identification and Analysis Project (VOGRIPA).